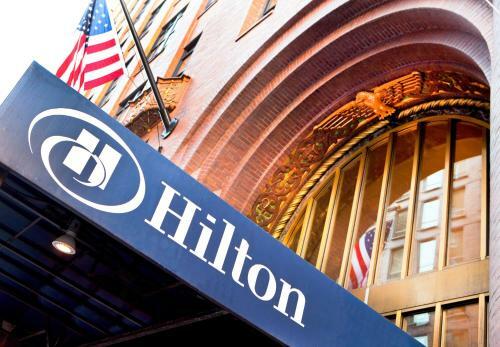 With a stay at Hilton Boston Downtown/Faneuil Hall, you'll be centrally located in Boston, within a 10-minute drive of Boston Common and TD Garden. This 4-star hotel is 4.4 mi (7.1 km) from Fenway Park and 5.5 mi (8.9 km) from Boston University. Make yourself at home in one of the 403 air-conditioned rooms featuring refrigerators and flat-screen televisions. Your pillowtop bed comes with premium bedding. Wireless Internet access (surcharge) keeps you connected, and cable programming is available for your entertainment. Bathrooms have complimentary toiletries and hair dryers. Take advantage of recreation opportunities such as a 24-hour fitness center, or other amenities including concierge services and gift shops/newsstands. Enjoy American cuisine at Fin Point, a restaurant which features a bar, or stay in and take advantage of the room service (during limited hours). Breakfast is available for a fee. Featured amenities include a 24-hour business center, express check-in, and express check-out. Planning an event in Boston? This hotel has facilities measuring 10000 square feet (929 square meters), including conference space.